New Zealand’s first away win for three years in Bulawayo came at the expense of a seemingly resurgent Zimbabwe side, who pushed them all the way in the only Test of the series. A thrilling encounter was won by 34 runs, firstly set up by the batting of Guptill, Taylor and Williamson, and finished by a five-wicket haul from debutant Doug Bracewell. Concerningly, in a fixture where the Kiwis should have been smoothly running the show, it was left up to the 21-year old to halt an impressive 4th innings chase, while the much older hands of Martin and Patel were left floundering. The Black Caps’ attack did not have much go their own way. They were missing arguably their best new ball bowler in Tim Southee, and had a frustratingly large number of home-town decisions to deal with. Most unfortunately of all, they came up against a Brendon Taylor who set about proving he is more than the best batsman in a team making a new attempt at Test cricket – he is now among the finest batsmen in the world. Perhaps the most impressive aspect of his final day hundred was the speed at which he scored – the 100 came up from just 118 balls – as Taylor, in only his third match as captain of this new side, aimed to shoulder as much responsibility for getting the runs as he could. It was a bittersweet affair for the Zimbabweans. They pushed the established side all the way, but throughout the chase there was – ultimately correctly – a feeling that Zimbabwe would fall apart once Taylor got out. They cannot afford to rely on him, because having only a few excellent cricketers in their side, without the consistent players around them leads to a curse of cricketing opinion – the curse of being “competitive”. A run of “competitive” matches without any real success, followed by another drop in performance, is the standard pattern that Bangladesh fans have grown weary of. Being competitive only lasts so long. The truth is that for Zimbabwe to really make an impact on the world game, they need points in the win column. Sri Lanka have just lost their third three match series in a row 1-0, to a Pakistan side that is unbeaten in its last four series. Two sides making a seemingly opposite progression were expected to meet in the middle for a closely foughtseries in Arabia. Instead, we have a 1-0 scoreline that belies a steady but comfortable outplaying of the Sri Lankans. Chief among Sri Lanka’s woes is the ongoing failure to adjust to the loss of Muttiah Muralitharan. It was never going to be easy – how well could we really expect them to adjust to loss of one of the greatest bowlers of all time? But well over a year on, at least the beginnings of a new attack should have come together. Instead, they find themselves constantly chopping, changing and – inexplicably – rotating an unreliable and often toothless outfit. The result is no wins in 14 attempts, and a combined average of 43.5 (worse than any other side in Test cricket) to go with it. The unreliable attack is not helped in the slightest by Tilakaratne Dilshan having been thrust into the captaincy following the World Cup. Along with his bizarre delayed declaration on the final day of the third Test and evident acceptance of himself as the go-to bowler, he has dramatically lost form with the bat. Moving up and down the order, he has averaged only 24.81 since his 193 at Lord’s. The decision to make Dilshan lead the side has been, more or less, a disaster. They have lost a fine opening batsman and gained a poor captain. Sri Lanka’s bowling has worried them for some time now, but the batting has steadily begun to follow suit, having been bowled out on the first day of the first two Tests despite the slow and comfortable Arabian wickets. The batting came together for the final Test, but by that point it was too little to make a difference, as Pakistan’s batsmen were able to consolidate their series winning position. Sri Lanka’s top six, that looked so formidable last year, has been reduced to little more than Sangakkara alone of late. Jayawardene has lost form, Samaraweera has been needlessly dropped, and Mathews – now an experienced hand at the one-day game – still lacks the test match nous to be a reliable no.6 beneath a struggling lineup. Meanwhile, stripped of Dilshan’s power and Mahela’s class alongside him, Paranavitana’s defensive role has been made to look more like a role of simply not scoring runs. He may well be the next to go. Pakistan, on the other hand, seem to be becoming an all-round consistent and refreshingly competent side. Unbeaten now for four series, plus a win over Zimbabwe, they would appear to have no obvious problems, besides the poor-as-ever dropped catches that cost them the first test. The one thing the neutral may miss is that Misbah’s outfit has a strangely un-Pakistani look to it. The batting is limited but hard-working, such as the promising Azhar Ali, Taufeeq Umar, and Mishbah himself, while the long suffering Younis Khan plays a classy but equally stoic role. None are willing to go for an ambitious run chase. Being sensible should never be complained about – we are seeing Pakistan’s batting being slowly dragged up to competence after the ineptitude of the 2010 tours – yet with Pakistan the neutral craves an aspect of cricketing madness. Umar Akmal has been conisgned to the sin bin of the domestic circuit, leaving only Mohammed Hafeez in the top order to deliver the kind of blink-and-you’ll miss it genius we have come to expect from the men in green. Even then, Hafeez is only this way with the bat – his handy but turnless off spin fits rather well with the new bowling attack, which rewards long-term first-class workhorses like Aziaz Cheema and Abdur Rehman. Were it not for Saeed Ajmal’s doosras, one would question whether this was Pakistan at all. 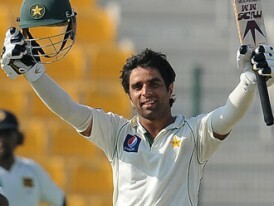 With the possible exception of Junaid Khan, there is no richly talented youngster with the world at his feet. Given what is currently happening to the last one, perhaps this is just as well. Test cricket between Australia and South Africa has long been one of the highlights of the Test game. For years following their re-admission, South Africa were the talented young upstart fancying their chances against Australia’s big time of world cricket, and for years they were put in their place. That was until 2008, when Graeme Smith led his side to the pinnacle with an unbeaten run lasting nearly two years, cumulating in his side’s first ever win on Australian soil in 2008-09, the first time anyone had won in Australia for 15 years. South Africa are favourites now – on paper, they have gotten even stronger. The likes of Dale Steyn, Morne Morkel, AB De Villiers and Hashim Amla, who established themselves in Test cricket during that run of 07-08, have since shown themselves to be truly world class, and in Steyn’s case, the world’s finest. Yet after their finest hour at the end of 2008, their progress stalled. The return series in early 2009 was lost at home, and since then South Africa have won just the one series, against the West Indies, in four attempts. The drawn series have piled up while first India, and now England, have stolen their limelight. They will be hoping that the two new additions make an impact – opener Jacques Rudolph has gained a second wind, while the country-hopping Imran Tahir looks like the devilish spinner South Africa have so often lacked. Australia’s story is rather more complex. Taking back the trophy from the South Africans in 2009, they boasted a new-look side rather than the ageing one that had dominated world cricket. Phil Hughes, Mitchell Johnson, Marcus North and Peter Siddle were the new men in on the act. But the final 18 months of Ricky Ponting’s captaincy were an utter disaster, and the Australian side has had to dig deep, and re-emerge with a brand new captain, new coach, and half a dozen new players. Shaun Marsh, Nathan Lyon and especially Ryan Harris are leading the charge, and once again they – along with Hughes, Johnson and Siddle – travel to South Africa with a job to make their names for the new age. Michael Clarke’s side is still rebuilding – questions persist. Where can Ponting bat? Is a medium pacer like Trent Copeland the answer? Can they afford to accommodate Johnson’s swings and roundabouts? Does Phil Hughes deserve his second chance? There is little time to test the waters in a two-match series. Nonetheless the new era has started with a positive, a promisingly efficient defeat of Sri Lanka away, along with a brace of ODI series victories. The latter of was a defeat of their current hosts, who would have been grateful to at least shake of some of the rust by nearly a year out of Test cricket. Form, then, undoubtedly takes the side of the Australians. They may not be the bookies’ favourites, but in a 2-Test series – really a middle distance run out compared to the genuine marathon that is a 5-Test battle – between two closely matched sides, guessing a winner is no easy task, and it makes for an interestingly tight affair. That’s not to suggest all is well here. Looming over the upcoming series is the sheer miserliness it must have taken to give us only two tests between two of the world’s top draw Test teams. The reasons behind this are many, but the compromise reached sets a worrying precedent for one reason – it is a solution that no Test cricket fan will be happy with. Cricket should never be played for anyone if not the fans, and if they’re not happy with the solution, then it simply isn’t one.